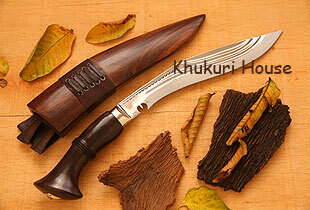 This very new Khukuri Blade from the stable of Khukuri House is very much like the famous "Khuchuri" but with a different handle which is not Flat tang but Rat tail tang and a leather fog to carry the blade. A small change yet giving this blade a unique beauty. One more to your collection of armor or one more for your book shelf. The blade on this blade has been made a bit slimmer making it lighter retaining the famous Sirupate shape. This new Khukuri also comes with a new display stand which can be screwed and unscrewed and with certified words from the Ex Gurkha officer (Lalti Kumar Lama) mentioning the blades are of Highest quality and handmade from Nepal and with his Signature on it. A perfect piece to collect.